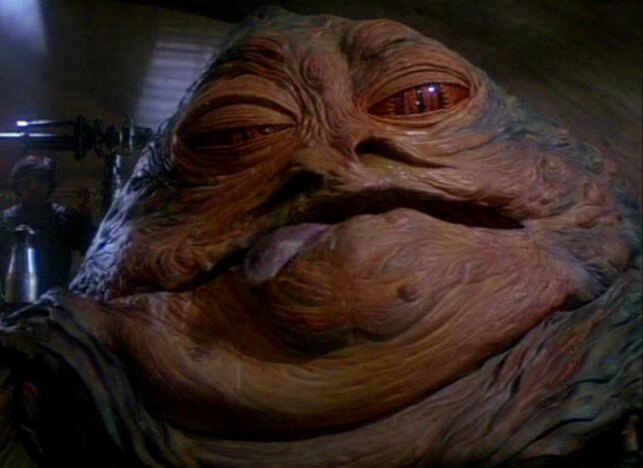 There’s nothing quite so vile and disgusting in the Star Wars universe as the Hutt species. From Jabba and Ziro to the even uglier female Hutt known as Gardula Besadii, the Hutts are basically giant anthropomorphic slugs with a penchant for crime, women, and partying. When George Lucas first envisioned Jabba the Hutt for Star Wars: A New Hope, he wanted the character to be furry like Chewbacca. Eventually, the director filmed the scene where Jabba and Han Solo argue near the Millennium Falcon about Han getting boarded, and the character was portrayed as a human male with a furry coat. Lucas intended to replace the actor with a stop motion character, but the attempt didn’t really work. This scene was cut until digital technology replaced the actor with a CGI Jabba in 1997, so the first time we really see the ugly slug is in Return of the Jedi. This film, along with other installments, doesn’t really give much of a backstory for the Hutts. To understand a bit more of the canonical history, you have to go to the Clone Wars animated TV series, which features more Hutts and more information about them than any of the movies. Simply put, the Hutts were intergalactic gangsters who controlled a crime ridden region of space called “Hutt Space”. Their empire, mediated by the Grand Hutt Council, consisted of many illegal exploits such as slavery, unlawful trade, and smuggling. The Council was made up of members from five different crime families, forming something like a mob for intergalactic life forms. Their adopted home world is called Nal Hutta, a hot, boggy planet. They are said to have once been the most powerful species in the galaxy, working harder at trade and economics than any other species. It could also be said that they never stopped being the strongest, for though the Republic and the Empire overshadowed them in many areas, there were quite a few secrets that the Hutts could keep from these organizations – secrets that led not only to extreme wealth for the Clan, but pain and suffering for those caught up in their schemes. Indeed, during the reign of the Empire, it seemed that Tatooine was still under Hutt rule and largely ignored by the Supreme government of the time. 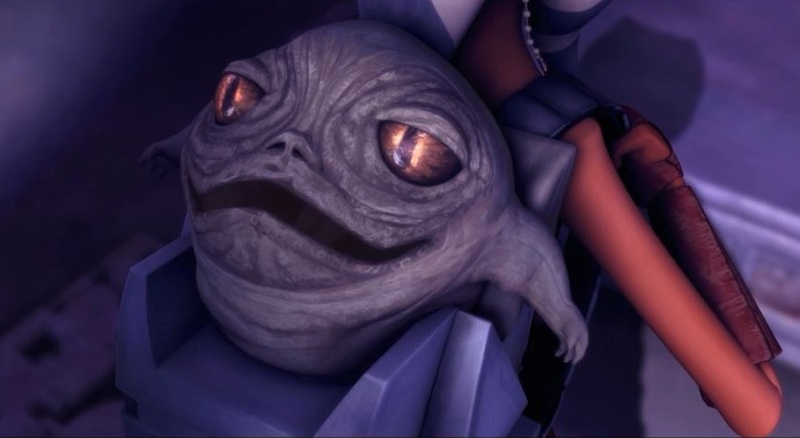 Rotta- Oh, what a beautiful baby you have! Early on in the Clone Wars, Jabba’s uncle Ziro conspired with Count Dooku and the Separatist movement to kidnap Jabba’s young son, Rotta. Ziro assumed the Jedi would fail, and if the heroes were executed then the Republic would arrest Jabba, which would allow Ziro to usurp his nephew’s place of power. Although the Hutts were the scum of the galaxy, the Republic wanted their aid in the war with the Separatists, specifically the use of the Clan’s hyperspace lanes. Dooku wanted to frame the Jedi for Rotta’s kidnapping, but after the Jedi succeeded in rescuing him, Jabba sided with the Republic. Ziro was arrested, but in a later story arc he was freed by the bounty hunter Cad Bane. 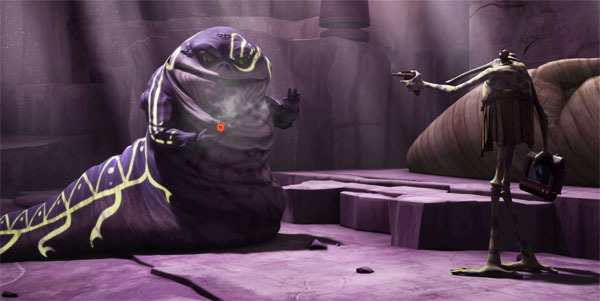 The Hutts had hired Bane to bust Ziro out before the sentient slug could reveal damaging information about the Hutts’ crime empire to the Republic. Alas, Ziro’s liberation would be a short one – he ended up being killed by his lover, Sy Snootles. The Sith Lord Darth Maul and his brother Savage Oppress formed a criminal empire called the Shadow Collective. They attacked the Hutt clan, first at the Council Chamber of Nal Hutta and then again at Jabba’s palace. The Collective threatened the Hutts, offering to spare their lives only if they gave their own empire’s resources over to the Collective. The Collective then used the Hutts’ fighters and resources to briefly take over Mandalore before Maul’s evil empire destroyed itself, as its members fought both each other and their ally, the Death Watch organization. Maul and Oppress were later defeated at the hands of Darth Sidious. Before the actual Clone Wars, Jabba Desilijic Tiur and his equally hideous friends practically owned Tatooine, and one of their favorite events was the pod races. Jabba didn’t realize it at the time, but the young Anakin boy he had seen win the Boonta Eve Classic race would go on to become an intimidating villain with whom he would later have dealings (Vader met Jabba and requested bounty hunters and resources in exchange for the Empire looking the other way in regards to the clan’s criminal exploits). Ultimately, this boy would also be indirectly responsible, at least in part, for Jabba’s death – Leia wouldn’t have been in the picture with Jabba (and probably wouldn’t be alive after being captured by Vader in A New Hope) if Luke (and Han) hadn’t been involved – and Luke, this mysterious Jedi that Jabba didn’t take seriously and tried to feed to a rancor, was the son of none other than that little slave boy who won the pod race on Tatooine. Around the same time, Jabba had placed a bounty on the life of his former top smuggler, Han Solo. Solo had previously lost Jabba’s smuggled cargo while being boarded by Imperial forces, and he never paid the Hutt back for the loss. As Solo began to take his place in the Rebel Alliance, Vader captured him and handed him over to bounty hunter Boba Fett, who took Solo’s carbonite frozen body to Jabba. Princess Leia Organa, in bounty hunter disguise, came to rescue him. After waking Han up, she was caught by Jabba and forced to become one of his slaves. Luke Skywalker showed up to save his friends, and after defeating Jabba’s rancor, the heroes were led to the Great Pit of Carkoon to be executed. Thanks to Skywalker, a fight then ensued between the good guys and the bad. While Jabba was distracted by Luke’s Jedi heroism, Leia used the chain by which she was imprisoned to strangle Jabba to death. This ushered in a new era for the Hutts… one of decline and failure, especially when the Rebels eventually defeated the Galactic Empire. All thanks, in some way, to that little boy who won the Tatooine pod race so many years before. Which Hutt storyline is your favorite? Let us know in the comments, and Let Your Geek Sideshow! Looking for more information about Jabba the Hutt’s infamous Tatooine palace? 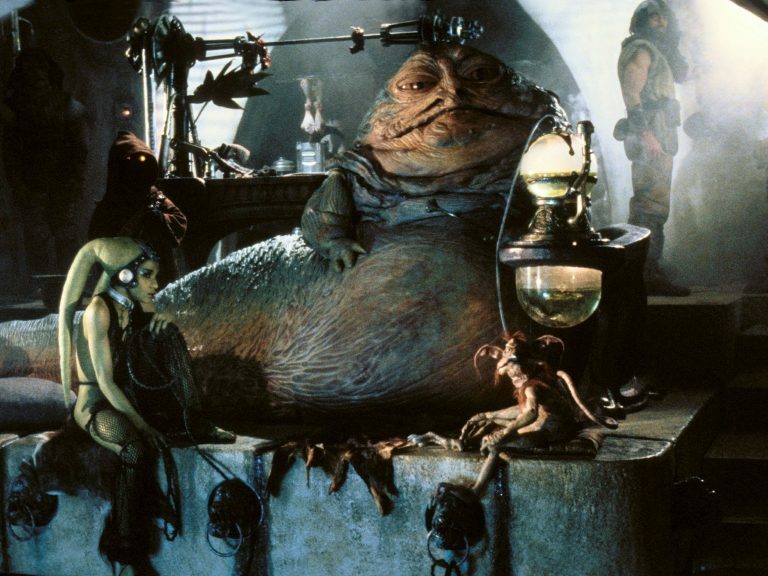 Check out the Top 10 Alien Creatures Featured in Jabba’s Palace!